This is at least a beginning and a good one. Disturbed tissues do react. However there is plenty of other things going on that we do not know how to detect. This is a deserving research project and we at least have a good starting point for that magic tricorder. I think we really have a shot at it but I also know that it will not be easy. We can also gather a lot of data, much not directly too informative but part of a base pattern best known. It may be possible to integrate that also. I have no doubt that such a device will eventually emerge. BARI, Italy—An Italian scientist’s search for a better landmine detection method brought him to the unexpected discovery of a device to detect a more deadly foe—cancer. The Trimprob (Tissue Resonance InterferoMeter Probe) Bioscanner is noninvasive and quick. Its use recalls Star Trek’s fictional device, the tricorder—the doctor passes it over the patient’s body and a frequency diagram signals a problem area in real time. In two to five minutes a diagnosis is made, eliminating the emotional strain of awaiting results and allowing for a quicker start to treatment. Clarbruno Vedruccio, a physicist and engineer, had gastritis in 1992 while developing landmine detection instruments. He noticed that the radio waves from his device interacted selectively with the ill tissue in his body. He found at 930 megahertz (MHz), the middle of the cellphone frequency band, he could detect inflamed tissues. He redirected his research and found 462–465 MHz was the key frequency for detecting cancer. Mitochondria and microtubules vibrate on that frequency when they are degraded because of cancer. He patented the Trimprob in 1999, and recently signed an agreement with Emergency Solutions to get it into hospitals. Dr. Giuseppe Peda uses the Trimprob on his patients in the southern Italian region of Calabria. Peda told the Epoch Times he only uses the instrument for the diagnosis of prostate tumors, as the studies only show that cancer can be detected in this kind of tumor with accuracy. The test results show variable degrees of precision with other kinds of cancer—usually about 70 percent, Vedruccio said in a YouTube video. Peda confirmed that the examination is easy and noninvasive. This has made patients interested in using it, but many physicians remain reluctant because of a lack of information, Peda said. Still, the Trimprob is available in about 50 hospitals in Italy, and also in Iran, Brazil, Japan, Turkey, France, Sweden, Malaysia, and Belgium. The costs are relatively low. An appointment and use of the scanner costs roughly 130 euros ($170), but most of that fee is due to the visit and not to the scan. 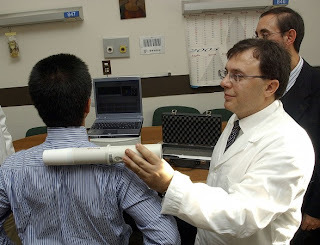 The Trimprob is likely to be used only as an instrument for the first diagnosis, which is then confirmed using traditional means, Vedruccio said. Peda said the Trimprob is gentler than traditional means. It emits a magnetic field weaker than that of a cordless phone. Vedruccio has met with both skepticism and support from the scientific community. At a conference he attended, an audience member accused him of “witchcraft,” he recalled in an interview with Italian newspaper Il Giornale. He was given an honor by Italy’s president only bestowed once before—on Guglielmo Marconi, who invented the telegraph.